Gerard H. Gaskin’s radiant color and black-and-white photographs take us inside the culture of house balls, underground events where gay and transgender men and women, mostly African American and Latino, come together to see and be seen. At balls, high-spirited late-night pageants, members of particular “houses”—the House of Blahnik, the House of Xtravaganza—“walk,” competing for trophies in categories based on costume, attitude, dance moves, and “realness.” In this exuberant world of artistry and self-fashioning, people often marginalized for being who they are can flaunt and celebrate their most vibrant, spectacular selves. From the quiet backstage to the shimmering energies of the runway to the electricity of the crowd, Gaskin’s photographs take us to the ball. 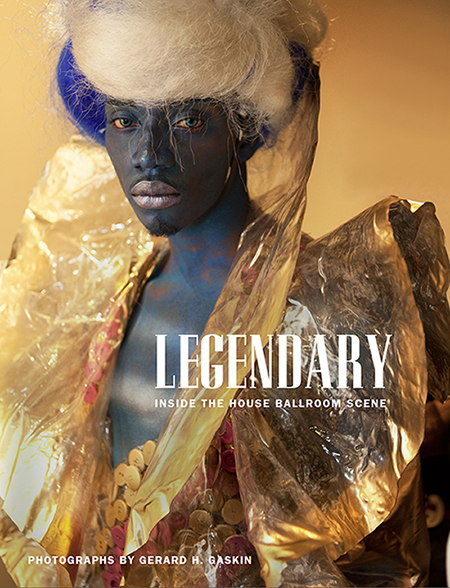 Legendary, comprised of photos taken at events in the New York City area, Philadelphia, Richmond, and Washington, D.C., is a collaboration between Gaskin, a camera-laden observer who has been attending balls for twenty years, and the house members who let him enter the intimate world of ball culture. In addition to an introduction by Deborah Willis, Legendary includes an essay, “The Queer Undercommons,” by Frank Roberts.